« Is This a Case of Government Overreach or an Example of Proper Law Enforcement? What Happens When Looters and Moochers Outnumber Workers and Producers? The all-time, most-viewed post on this blog is this set of cartoons showing how the welfare state begins and how it eventually becomes an unsustainable mess. The great Chuck Asay has a cartoon that takes the next step, showing what happens when the looters and moochers who ride in the wagon get pitted against those who are pulling the wagon. Since I’m not a Romney fan (for a bunch of reasons outlined here), I would have preferred if the cartoon didn’t imply anything about the current election and instead focused on the rhetorical question of what happens to a society when those living off the government outnumber those who get stuck picking up the tab. But it’s a very clever cartoon, so it’s worth sharing even if I’m nitpicking. You can see my favorite Asay cartoons here, here, here, here, here, here, here, here, here, here, here, here, here, here, and here. You don’t have to be a Romney fan to recognize that 4 more years of Obama leads to this much faster, at least, than 4 years of Romney. I thought it was great when the Republican Congress and Bill Clinton put in welfare reform but now that has been done away with and no one has to work anymore it seems. In fact, over 40% of the USA is now on the government dole. What is going to happen when that figure gets over 50%? Maybe this cartoon below will be true. GREAT CARTOON!!! When it hurts this bad we just have to laugh sometime. Whenever A (the looter) takes from B (the producer) to give to C (the moocher)–keeping some for himself, the incentive is HUGE for people to quit being B and start becoming A and C. Unfortunately, once “the genie is out of the bottle,” the task of inducing people to cease being A or C and to return to being B is herculean at best and impossible at worst. The moment there are too many looters and moochers for the producers to support, the system collapses–and that point is well shy of the 50/50 point we’re at right now. As Lady Thatcher says, socialism runs into BIG problems when we run out of other people’s money. The most ominous element (not depicted) is the number of people in the front cars who say “#%^| it, I’m moving to the back wagons”. That is about to happen in spades come 2014 when the trailing wagons will start offering healthcare paid by others. The whole caravan will start slowing down to a European like 1-2% growth speed while a fast growing emerging world submerges America into the worldwide average. Perhaps it has already started. Perhaps the anemic growth we are now experiencing is the new norm, a european like subpar growth trendline to decline. But heck, if HopNChange is wrong and we see ourselves submerging into the worldwide average, then we can always go back to an environment where individuals are generally expected to earn the exceptional healthcare they expect in the US. Can’t we? Yes, if you are wrong, you can always go back. Look how many European countries have. Keep dreaming and hoping that it won’t be too bad. Many one cultures met their demise down the same path. The script is now playing its reliable tune for Americans. If you are not drawing alternate plans, if you are placing all you eggs in one basket counting on America maintaining its current top prosperity position in the world, then you are doing so at your own peril. Maybe patriotic, but foolish. Under the same altered incentives to produce, America and Americans will end up exactly where the rest of the world is. The writing is on the wall. 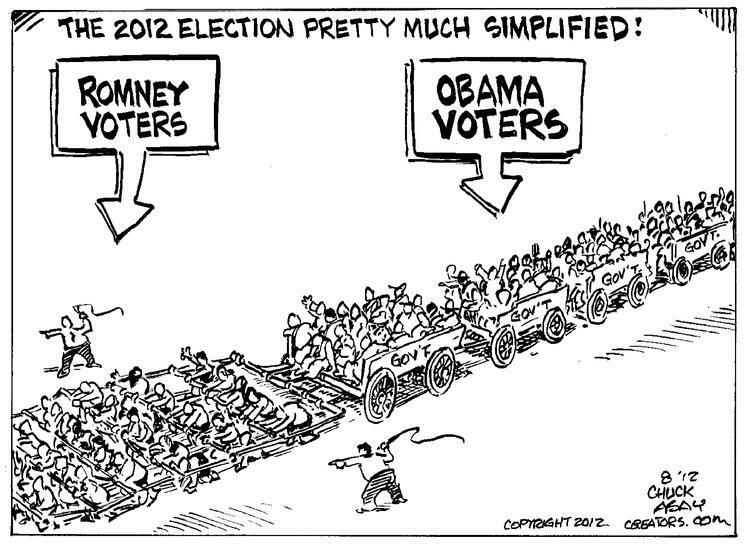 Q: What’s the difference between a Romney voter and an Obama voter? A: Romney voters sign their checks on the front, and Obama voters sign their checks on the back. What happen when Looters & Moochers Outnumber Workers & Producers? Obama win and we all like North Korea socialist country everyone well look up to the Government for a piece of bread. Whats out!! It’s worth noting that many Obama voters actually see themselves as the guys pointing the way & aren’t quite aware that they’re carrying whips.